Deb's Cup of Tea: It's Not Real!? I wanted a Cherry Coke. While Dr Pepper is my soda of choice, there are days when I want ginger ale or 7Up or Coke. You know the craving. On Saturday, I sat looking through the grocery ad, deciding what I really needed. Cereal. Bread. Oooh eggs were a buck for a dozen large. I can use those. Grapes. Bananas for my cereal. Coke, in these little bottles, was on sale really cheap. Two years ago, a tax was added to soda that removed the discount usually seen on it. I can't find the details now, but the days of 79 cent 2-liters is, effectively, gone. You can still find 99 cent 2-liters, but usually in conjunction with the purchase of something else. A "good" buy is a 2-liter for $1.19. This means my consumption of soda has dropped, which it should. Nothing is less nutritional than soda. I drink a lot of seltzer water now. I get the carbonation that I like with none of the sugar. Yet, there are days when only a soda will do. The weekend was one of those days. Now, I didn't want just soda. I wanted a Cherry Coke. The stuff that is passed off as Cherry Coke is NOT a REAL Cherry Coke. 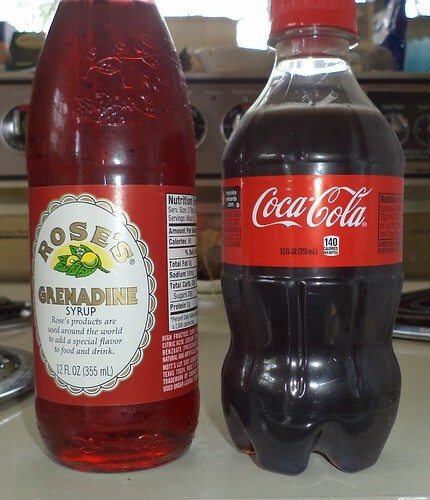 A REAL Cherry Coke is made with Grenadine. I use a double shot of Grenadine and add it to the amount of Coke contained in this smaller bottle. I think that's 8 ounces, as opposed to the 12 ounces in a 6 pack. These were 8 to a pack. The taste conjures up memories of going to the drug store in town, sitting at the counter and ordering a cherry coke. Two pumps of Grenadine, 8 ounces of Coke, mix and serve. A chocolate Coke was whipped to a froth so the chocolate syrup would mix with the cold Coke. I think they had vanilla and lime Cokes, too, but those aren't flavors I like mixed with my Coke. I sometimes think that a place that served up the old soda fountain ambiance along with ice cold real Cherry Cokes would be successful in today's homogenized food world. After all, recipes for items served at soda fountains abound on the internet. You're serving not just snack items, but a large helping of 1950's era nostalgia. There's a huge market for that. There was also a certain cache to being a soda jerk. It wasn't until the end of the era with the fountain that girls were allowed to be soda jerks. It was always a boy, a clean-cut high school boy who winked at your junior high self when he set your beverage in front of you. You really wanted to sit at the counter to watch those guys make their creations,too. They were wizards with sundaes and aerosol whipped cream. There have to be places where this is still lovingly preserved and you can sidle up to the stainless steel and Formica counter and order a Cherry Coke. Ironically, I actually thought to look at the ingredients in the Grenadine I brought home. "High fructose corn syrup" was the first ingredient. Well, how about that. I don't know any other Grenadine than Rose's. I remember it being on the shelf with the alcohol for my parents' New Year's Eve parties. There weren't any signs of fruit juice in this bottle. "Artifical flavors". Hmmmm, so much for feeling like I was authentic here. Research on grenadine has taken me to looking for a middle eastern grocery. "Real" Grenadine is the juice from a pomegranate and is generally sold in those stores. Sometimes blackcurrant or cherry juice is added. Perhaps my quest this summer should be to try a "cherry" Coke with something more closely resembling a cherry flavor. Sorry Rose's. After many decades in my fridge, you're no longer welcome.